We provide professional development and training which builds the capacities for spontaneity, creativity, and co-creation of progressive relationships. The training is suited to professionals who want to significantly expand their ability to appreciate and intervene with those they work with, in fresh, creative, and original ways. We have a vision of able men and women expressing themselves relevantly in the ordinary here and now situations in which they live and work. The psychodramatic method is one that calls for expression of our inner self through both mind and body. Expression is responsive, creative, brings joy to the human spirit, uplifts the soul and makes us feel part of the universe again. This website is designed to serve those interested or involved in exploring and learning about psychodrama, sociodrama, sociometry, role training. This includes all uses of action methods for group work, group training, group leadership, and group psychotherapy. Psychodrama Australia seeks to awaken and strengthen the abilities of people in many settings to express themselves relevantly, responsively and creatively in the ordinary here and now situations in which they live and work. Training is pertinent to people interested in enlivening personal, interpersonal and group functioning in the fields of health, education, organisational development and creative arts. The training deals with the experiences of the individual in groups and emphasises a systems approach to living. Trainees can expect to develop greater sensitivity and proficiency in interpersonal, group and inter-group relations. This page lists all the recent and upcoming programs that are being run throughout Australia at our 5 campuses. You can also click on the Campus button above or use these links here: Adelaide, Brisbane, Melbourne, Perth, or Sydney to see the specific programs coming up at that campus. If you click on the green button, or the title line of one of the events, you will be taken to all the details of that program, and to the campus that is running it. If you click on one of the campus buttons below, or in the header above, you will immediately see the upcoming programs for that campus. For further information please contact us by clicking here, or read further with our Frequently Asked Questions, or check out which is your local campus by clicking here. Trainee’s ability to make assessments will be enhanced during this workshop. There will be opportunities to investigate how the psychodramatic method can assist people who are anxious and depressed to warmup creatively and spontaneously to life. Trainees will familiarise themselves with what leads to anxiety and depression? Waking up to spontaneity and creativity can help to unblock repressed emotions and create healing. The “Diagnostic and Statistical Manual of Mental Disorders,” DSM-V, will be introduced as one resource among many during the weekend and a YouTube “The Five Main Anxiety Disorders” will be used as a warm up to introducing the topic. 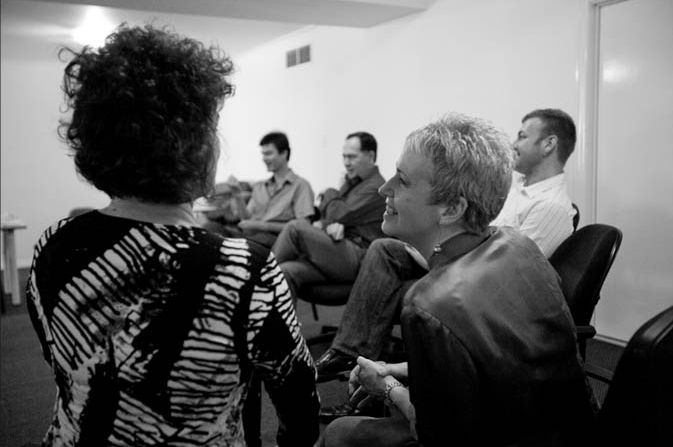 This training is the heart of psychodrama training at the Psychodrama Australia Brisbane Campus. It is open to those new to training through to those preparing for certification with psychodrama's professional association, the Australian and Aotearoa New Zealand Psychodrama Association (AANZPA). Helen Kearins is a sociodramatist from Canberra ACT and her thesis addresses the questions: How can sociodrama be used to enable people to recognise and own their own racism and move beyond it and so advance the process of reconciliation between white Australians and the First People’s? And: What can we learn about the sociodramatic method by its application in this area? The focus will be on exploration of the year’s training and the challenges faced in their own work situations. The group will explore integration of knowledge and techniques gained from previous workshops. This program is a five day non-residential psychodrama training workshop 16 - 20 October with Elizabeth Synnot and Sara Crane. The purpose of this five-day workshop is provide an intensive experiential training opportunity in psychodrama, sociodrama, sociometry, role training and general group work. These weekends are designed for those who have an interest in this method and want to learn more and for those considering entering the core training program. You can expect to be introduced to the four specialties of psychodrama; role training, sociodrama, sociometry and psychodrama as group psychotherapy. It is likely that you will participate in an enactment to recreate a new living moment and perhaps a new solution to life’s vicissitudes. There are currently no events to display in Perth. Check out the campus page to sign up for upcoming events in the region. During the year new programs will be added and you can either find them here or go straight to the Psychodrama campus page. All these programs are run by highly qualified and experienced trainers and group leaders who have been involved in this work for many years. The programs are highly engaging and are run using vibrant experiential learning processes. Integrate the profound body of Morenian theory about interpersonal relations and human development that you can apply in your chosen field. The AANZPA Board of Examiners, which has been appointed according to the Objects of AANZPA, Inc., accredits psychodrama conducted by training Institutes in Australia and Aotearoa New Zealand. Each Institute satisfies the standards set out in the AANZPA Training and Standards Manual and is subject to regular reviews. The AANZPA Board of Examiners also establishes and maintains requirements for certification as a Trainer, Educator and Practitioner (TEP) and issues a current practice certificate annually to each certificated Practitioner or Trainer (TEP) in good standing. AANZPA, Inc., is a constituent member of the Psychotherapy and Counselling Federation of Australia, Inc., (PACFA).